Chennai Super Kings coach Stephen Fleming tells Bikash Mohapatra he is worried about the kind of start his team has had in this edition of the IPL, but confident of a turnaround. Year 2010 was a fairy tale for Chennai Super Kings. Mahendra Singh Dhoni's team won their maiden Indian Premier League title in their third attempt -- having come up second best to Rajasthan Royals in the final of the inaugural edition in 2008 -- and carried forward their success story by becoming the first Indian team to win the Champions League T20 a few months later. Doing an encore though is proving to be a tough ask. In their six matches thus far, Chennai has won on three occasions and, dare we say, one of those -- the win against Kolkata Knight Riders in the tournament opener -- was by a whisker. On Monday, the defending champions moved up third from bottom (after five matches) to the top four again, courtesy their win over Pune Warriors India. And though all is not lost, suffice to say, it is not exactly the start they wanted. Repeating a success is never an easy task and the pressure of expectations is definitely one of the reasons affecting the performance of the holders. The Chennai think tank is aware of the same. To give credit where it is due, their coach doesn't deny that his side is under pressure. 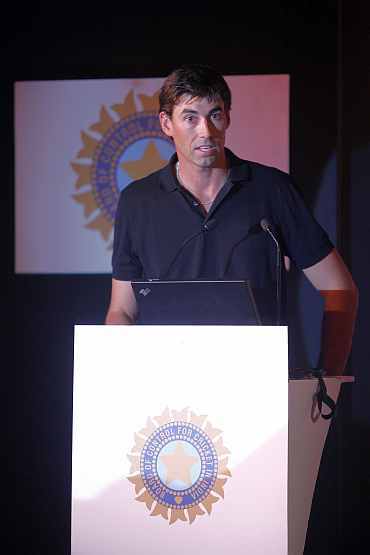 "Yeah, there is," admitted Stephen Fleming, when quizzed if his side is under the pressure of expectations. The New Zealander was quick to add an explanation though. "But it (the pressure) is something that we have placed on ourselves," he said, adding, "We want to be back in the final again; we want to get into the Champions League and we want to win because it is a great feeling. "So the pressure is not from outside. It's within the side that we want to keep doing well." The 38-year-old, who played for the Chennai outfit in the inaugural season before taking over as the coach in the next, took pride in the fact that his team has been the most consistent in the IPL thus far -- besides winning in 2010 and being the beaten finalists in 2008, the Chennai outfit also made it to the last four in 2009. "We have set a pretty consistent standard over the last three years," gushed Fleming, adding, "We have been there or thereabouts each season and we want to maintain that. "There is not much fun playing in a month-long tournament if you are not competing." The Kiwi said though he is worried about the kind of start his team has had in this edition, he is confident of a turnaround. "We have some very good players in the side and the situation we find ourselves in is not unfamiliar," explained Fleming, adding, "So we are certainly not pressing the panic button yet. "We are just desperate to do well and we will work hard towards it." Fleming's point is an important one, as Chennai have put themselves in a hole before and have been able to come out of it. Chennai had lost five of their opening seven matches last year before winning seven of their last nine, en route to their maiden title. In the 2009 edition, MS Dhoni's men lost three of the first five matches -- with one match abandoned because of rain -- and rebounded by winning the next five and making it to the last four. Fleming insisted his side can turn things around again. "We have been close but are not getting it across," he explained, adding, "We are competing well but we have to make sure we find that winning formula. "We have been in this position before and I am still very positive. But I am aware that we need to start winning games to come back into the competition." While he isn't much concerned about the manner in which his side is batting and bowling, it is the fielding that has him worried. The Chennai side's fielding is fluctuating, to the say the least. While it was pedestrian in the match against Mumbai Indians on Friday, it was at its best against Pune on Monday. And it is consistency in that department that the coach believes will make a difference. "Fielding is not one of the areas where we are as good as we need to be," admitted Fleming, before elaborating his point. "We are a hardworking side, he said, adding, "We don't have players who are not full of flair or athleticism. "So we need to work well as a team, and, at the moment, I don't think we are putting in the effort that we need to." This negative aspect aside, Fleming seemed confident his team will end up matching their performances of the previous years. "We always start like this and keep get better as the competition goes on," he said, adding, "But we can't expect that every time and can't afford to fall behind. "At this stage we need to win three to four matches on the trot and it can happen maybe in a week. That good week, if it happens, can help us get back to the top of the table. But it is very tight at the moment." He outlined an easy strategy for his team's smooth progression. "In the last three games away from home, we have not managed to get the result in our favour. But we have managed to win everything at home. If we continue to win our home games the whole season, we are going to be in the top four. "We have worked hard to get into the semi-finals and the final and we will certainly try that again. Otherwise, there will be questions asked." On a personal note, though, Fleming has been given as extension till 2013 and admitted he is happy being with the outfit. "I am enjoying coaching CSK; it is a good challenge. I really enjoy working with a number of players over these two months," he said. Asked if success in this assignment would eventually lead him to coaching a national side in future, something he had denied earlier, the Kiwi was yet again evasive. "I am still learning the coaching philosophies and am working hard on the same. Also, I am trying to do things that I couldn't during my playing days. "But I had made that statement (of not coaching a national side ever) a few years back, when the time was probably not right, and as time goes on things change."